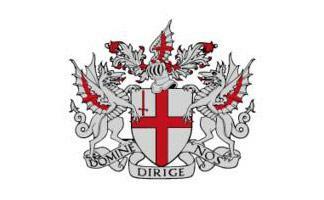 From Saxon times, the trade Guilds of the City of London (Guild meaning Payment which was required of members), later to become Livery Companies (from the distinguishing clothing “Livery” worn by members), have been involved in the governance of their City. This came about through a succession of Charters granted by the Crown which established, first the Sheriffs (Shire-Reeves or officials) and then an elected Mayor. From this foundation gradually emerged the present government of the City. The City of London Corporation today is a local authority with the Lord Mayor as chairman, assisted a “Lower House”, termed the Court of Common Council, and the Court of Alderman; an “Upper House”. This structure is supported by the bureaucracy necessary to service the needs of the City. In the past, the two Courts were elected only by residents of the City. More recently, to improve the democratic nature of the City’s governance, the representatives of commercial and other organisations with offices in the City were added to the Electoral Roll. This greatly swelled the number of voters in City elections. Unlike other UK local authorities, voting for the Aldermen and Common Councilmen is not based on party political lines. 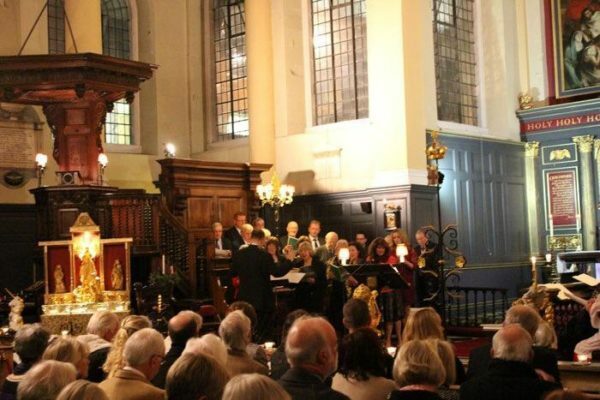 One of the main roles of Livery Companies is to support the Lord Mayor and the Livery still plays an active part in the City’s electoral processes. The City is divided into Electoral Districts, termed Wards. At this level, most if not all Companies are entitled and encouraged to vote for their ward representative Alderman and Common Councilmen. The Lord Mayor and the two Sheriffs are elected for a period of one year. To become Lord Mayor, an individual must be an Alderman who has served in the office of Sheriff. One of the ancient privileges granted to Liverymen is to elect the two Sheriffs and, following a summons from the Lord Mayor, this takes place annually in Common Hall at Guildhall. On a second such summons to Guildhall, the Livery assembled recommends a favoured candidate to the Court of Alderman, for Election as Lord Mayor. The Court of Alderman retires and its vote produces the Lord Mayor for the year ensuing. The British Plastics Federation (BPF) is the UK’s leading Plastic Trade Association. Established in 1933 the British Plastics Federation is the most powerful voice in the UK plastic industry with over 400 members across the plastics industry supply chain, including polymer producers and suppliers, additive manufacturers, recyclers, services providers, end users, plastics processors and machinery manufacturers. The BPF promotes the interests of its Members principally through its four Market Sector Groups and its many common interest Business Groups. The BPF Central Expert Committees address industry wide concerns including Environment, Fire, Product Safety and Industrial Health & Safety.The Horners maintain strong links with the BPF and a number of Past Masters and our current Master have been past presidents of the BPF. The Horners Plastic & Bottlemaking awards are sponsored jointly with the BPF. 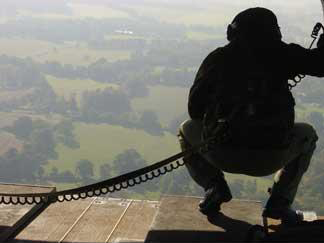 Most Livery Companies support a member of our armed forces and the Horners support 27 Squadron RAF based at RAF Odiham in Hampshire. 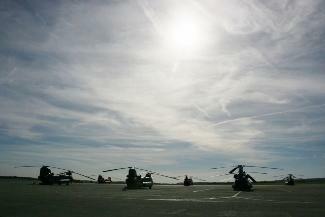 The Squadron flies Chinook helicopters comprising of three flights A,B and C. Each flight consists of 7 crews of 4 (2 pilots and two crewmen) and deploy as an autonomous unit. There is a great spirit of competition between the flights and each year they compete for the Redmile Horns (pictured right) which are presented to the winners by the Master. 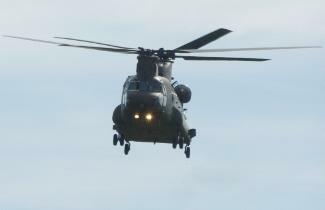 The flights take turns to provide cover in the UK for National Standby, to train and to deploy. They were until recently deployed in Afghanistan. In recent years the Horners sent Christmas Parcels to those of 27 Squadron deployed in Afghanistan and one was placed at the foot of everyone’s bed in lieu of Christmas stockings which were much appreciated. 27 Squadron provides the Guard of Honour at our annual banquet in the Mansion House. 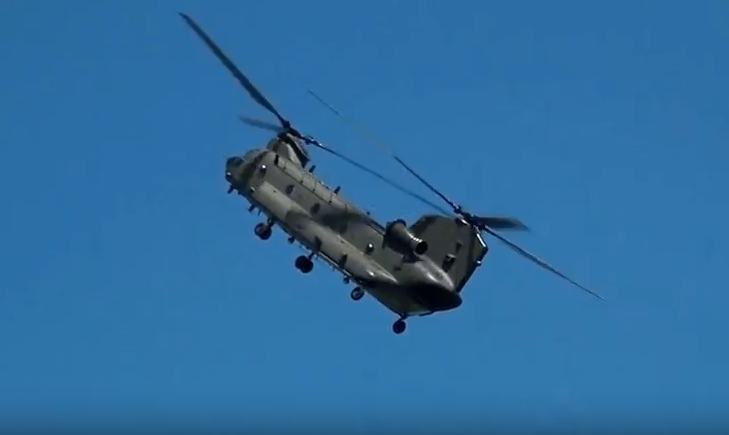 When Camp Bastion closed in late 2014, the Chinooks form RAF Odiham in Hampshire flew to its previous main operating base of Kandahar for a few weeks before making the long flight north to Kabul. 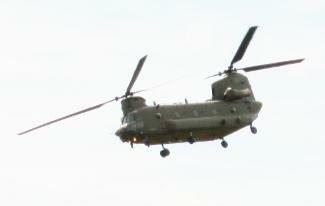 Three Chinook helicopters were sent there to support the new British Operation; Op TORAL. 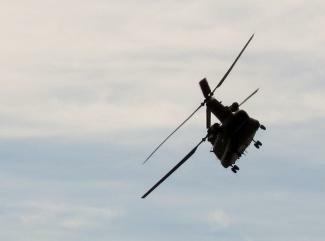 Three crews from 27 Squadron, lead by Sqn Ldr Hannah Brown, were deployed to Kabul in November to assist the servicemen and women remaining in Afghanistan supporting the Afghan government and Afghan National Security Forces (ANSF) in non-combat roles. The focus of the UK’s efforts in the country has evolved from leading combat operations to training, advising and assisting the ANSF; this includes leading the training at the Afghan National Army Officers Academy. The main effort on Op TORAL was to keep diplomats, UK and coalition military and freight moving around the capital and off the roads, where there had been an increasing number of vehicle-borne improvised explosive devises. By using air we could transport people quickly and more safely to various locations in the city. We offered two Chinooks each day, but we were by far outnumbered by the Americans, who flew approximately 10-12 aircraft including civilian contract helicopters around the city. But for only flying two aircraft each day, we were certainly carrying our fair share and having a disproportionate affect on keeping people off the roads. In our first month when the number of vehicle-borne improvised explosive devises had increased, we flew roughly 2400 people. By doing so, time, the numbers of convoys and the danger that was placed upon people trying to move around the city was reduced to a minimum. It felt extremely rewarding as a detachment to know we were making the difference. The detachment was made up of experienced aviators who have spent a lot of time in Afghanistan away from their families. For some this was a return to Kabul from their first Afghanistan deployments in 2001/2. The Christmas gifts that were sent out to the detachment form the Horners’ really did make a difference. It made us all feel like we had a Christmas to celebrate and brought us closer together as a detachment in a time of year where family is paramount. 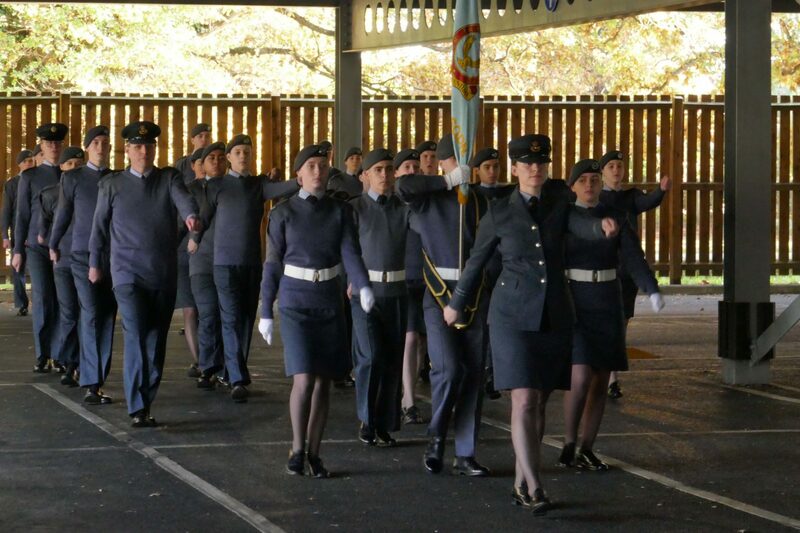 The Horners are pleased to have an association with Air Training Corp 1349 Sqn. Air Cadets, aged 13 to 18 and their supporting staff get the opportunity to participate in a large range of stimulating and rewarding activities. Where else could you learn to fly aerobatics, visit Royal Air Force Stations, tour foreign countries, play sports from local to International level, learn the skills to lead expeditions, become a target shooting marksman, gain your Duke of Edinburgh’s Awards, canoe through white water, assist your community, join a band, learn aviation subjects, go caving, parachute, climb, sail, ski…? These and much more are readily available to you as a member of the Air Cadet Organization, whether you are a cadet or staff member. The Museum of Design in Plastics (MoDiP) is part of the Arts University College Bournemouth. Its purpose is to provide a dynamic study and research resource to help the understanding and appreciation of popular design and culture in Plastic. The extensive horn collection owned by the Horners Company is now housed at this museum. Further details of the Horners collection at Bournemouth can be found by following this link to MoDip. The Plastics Historical Society (PHS) was formed in 1986 to raise awareness of the heritage of the plastics industry and to celebrate all things plastic. In so doing it also highlights the key role that natural polymers like horn, tortoiseshell and ivory had played for centuries in articles of utility and decoration. Because of the Horner’s Company’s close connection with the Plastics Industry, there is a natural affinity between the Company and the Plastics Historical Society, and a number of the Company are members of the PHS. The Company’s Horn Collection and the PHS’s own plastics collection are both housed at the Museum of Design in Plastics (MoDiP) in Bournemouth.